New Zealand has released Services NZ PSI, PPI Input and Output and the US will publish NAHB Housing Market Index. 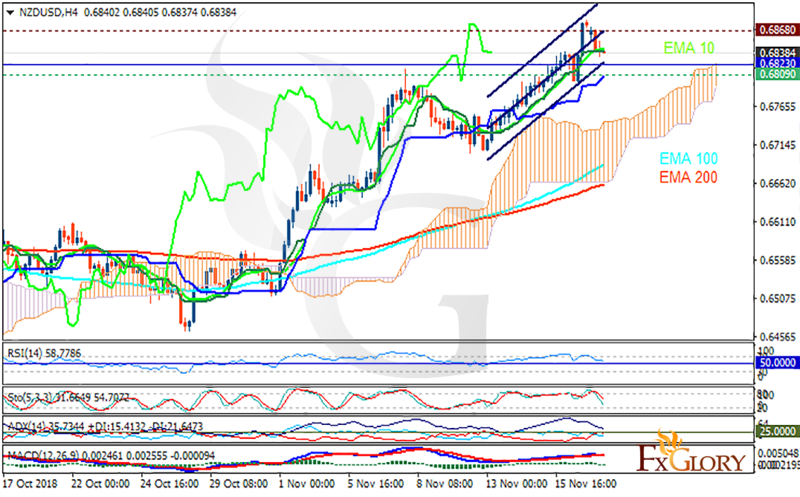 The support rests at 0.68090 with resistance at 0.68680 which the weekly pivot point at 0.68230 is located in between the lines. The EMA of 10 is moving with bullish bias in the ascendant channel and it is above the EMA of 200 and the EMA of 100. The RSI is moving above the 50 level, the MACD line is below the signal line in the negative territory and the Stochastic is showing downward momentum. The ADX is showing sell signal. The price is above the Ichimoku Cloud and below the Chinkou Span. The Tenkan-sen is showing a horizontal trend while the Kijun-sen is showing an upward trend. The indicators are showing mixed signals, the resistance level breakout will push the rate up towards 0.695, otherwise, it may fall towards 0.678.